Corn flakes, chocos, muesli and now the latest entrant, granola. Kelloggs continues to make strides into the growing breakfast cereal market in India. I had earlier written about how the breakfast cereal market growth in India can be attributed to changing consumer preferences, exposure, convenience and availability. Such breakfast cereal brands might be taking a good share from the urban consumer's wallet every week/month, but definitely not from my household. I don't have any kind of breakfast cereal stocked up in my pantry. It is such a waste of money and it does no good to our health, though the brands continue to scream otherwise. I just wrapped up my breakfast with ragi dosas (with homemade batter) and tomato thokku. With the batter and thokku prepared ahead, all it took me was less than 5 minutes to make the 2 dosas. Let's look at this new product - Kelloggs granola with almonds and cranberries. The front side of the pack says "Wholesome crunch - nutritious oats, real almonds, yum cranberry, corn crispies". According to this basic recipe from the popular blog "thekitchn", homemade granola requires just 7 ingredients - Rolled oats, honey or maple syrup, oil, dry fruits, nuts, cinnamon and salt. But if you look at this pack of granola, there are so many unwanted stuff like malt extract, dextrose, liquid glucose, wheat flour etc. 2) Macros - where do they stand as compared to our typical Indian fresh breakfasts? 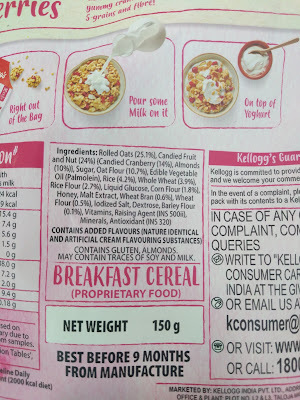 Those of you who avoid parathas and idlis for breakfast because they are "carbs", please note that the ingredients of this granola pack include rice flour and wheat flour as well. I had earlier highlighted the same point in my review of Kelloggs Special-K. Please check it out if you haven't. The table below is a comparison of the macros (Indian breakfast nutrition facts data from myfitnesspal). Let's not forget the accompaniments. The chutney/sambhar increases the amount of protein, fibre along with various other vitamins and minerals. Not to forget the healing spices. It is only our wrong perceptions that have been carefully influenced by heavy marketing, which has made us believe that such packaged cereals are low-carb/wholesome/light etc, whereas our Indian breakfasts are high-carb/heavy etc. 3) Typically, granola is made with honey. But if you see the ingredients list, the sweetener is primarily sugar and its various forms. 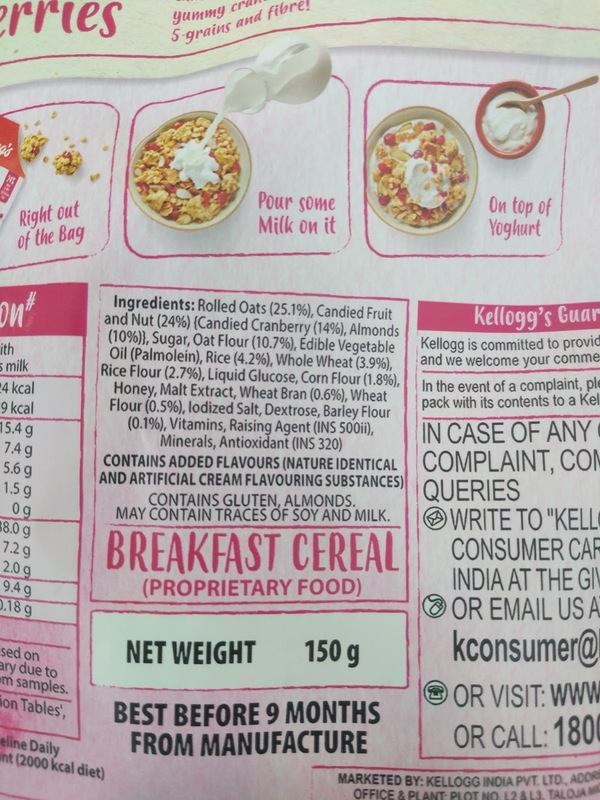 The nutrition facts table states that one serving of Kelloggs granola contains 7.2 gm of sugar (around 2 tsp of sugar). But please note that this is ONLY sucrose. The other types of sugar such as glucose and dextrose are not accounted for. 4) The fat used is the unhealthiest and cheapest oil available - refined palmolein. 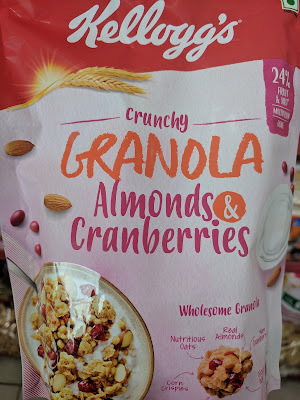 5) The first ingredient listed is "Rolled oats", which constitutes 25% of the granola mix. This would mean that a 40 gm serving would contain ONLY 10 gm of rolled oats. This also implies that the dietary fibre would be very low, which is proved in the nutrition table (2gm of fibre per serving). Do take a note of the raising agent (INS 500ii). Sodium bicarbonate causes corrosion of the gut and digestive issues when consumed in large amounts. The antioxidant (INS 320) is Butylated Hydroxyanisole, which is banned in Japan because of its carcinogenic and estrogenic effects. Can cause hyperactivity, asthma and allergies. In my previous post, I spoke about unscrupulous nutrition experts mushrooming everywhere and how people without proper qualifications call themselves as experts and guide people in nutrition and weight loss. This is my question to Person B who is being hailed as an Ayurveda expert in Instagram. A few days back, I came across her posts promoting Kelloggs Granola. Based on my limited understanding of Ayurveda, I believe that honey should not be heated. Person B, if you are a true Ayurveda follower, then how can you promote Kelloggs granola where honey is added as part of the baking process? For those of you who like to bake granola at home without honey, here's a good recipe using jaggery. I was actually thinking that how come such a tasty thing can be so healthy! !